He wants to meet both presidential candidates. Presidential candidate, comedian Volodymyr Zelenskyy will visit Paris to meet President Emmanuel Macron on the same day as President Petro Poroshenko, which is 12 April, the spokesman for Poroshenko's election HQ, Oleh Medvedev, has said. "I know that Zelenskyy will go to Macron. Using diplomatic channels, the French cleared this issue with the Ukrainian side. 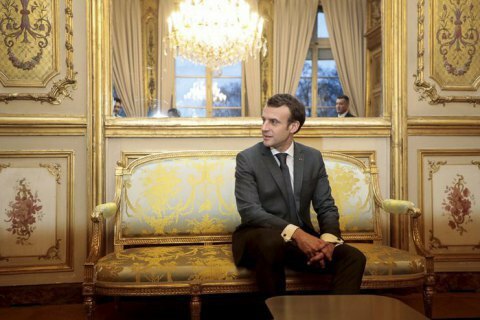 Poroshenko's position is that it would be useful for Zelenskyy to get off the stage, leave show business behind and dive into the world of real politics, including international one, to build some experience… Therefore I know that Zelenskyy will be in Paris this Friday, it seems, and will indeed meet Macron. Petro Poroshenko should be in Paris the same day and will also meet Macron," he said. Poroshenko will go to Paris to meet Macron after a meeting with German Chancellor Angela Merkel in Berlin earlier on 12 April.